I spent my Saturday morning walking around Wingham Wildlife Park in Kent like an over excited toddler. From Tigers to Flamingos there's loads of animals to see and loads of fab experiences to be had. Wingham is just £16 for adult entry and we spent around 4 hours in the park. If you have kids you could easily spend a full day there as there is loads of fab playgrounds, talks and feeding and places to eat. Food is a tad on the pricer side but we packed a picnic and there was plenty of seating available around the park to sit down and munch. When we arrived I headed straight to the Flamingo enclosure. I adore Flamingos and wasn't disappointed! The walk through enclosure lets you get up close and personal while they continue with their everyday lives. We then carried on round to see some adorable Meerkats, Otters and then probably my favourite part of the park; the tropical bird enclosure. Again this was another walk through experience and it was amazing! Not only was it full of gorgeous Lory's and other birds but there was even a butterfly enclosure! A great feature of the park is the moving dinosaurs. You can even sit in a car that makes it look like your being chased by a T-Rex which obviously we all did. There's even a fab sand pit with dinosaur 'bones' hiding in it, which if it hadn't been full of children I so would have been in. 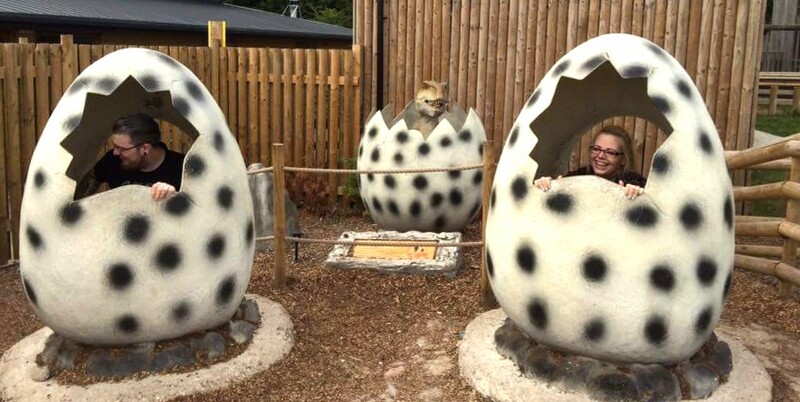 You even had the opportunity to climb inside a dinosaur egg and pretend you were hatching. Again this was more aimed at children and being 6 months pregnant it took me a while to get out of haha! The walk through Lemur enclosure was awesome. The cute furry little guys just run around so you can get up close and personal with them. One even mistook Stew's leg for a pole and tried to climb up it! Another fab part of the park for me was the penguins. You can walk around the entire enclosure so get to see them swimming, chilling and even saw a little fluffy baby one. aww. Overall we had a fab day, once the baby is born it's definitely a park I'd consider buying a season pass to as there's so much to see and do and they should be getting chimps soon! Flamingos are my absolute favourite!! Lovely post - I love going to places like this. This looks so similar to my trip to Paradise Park in Cornwall - although I didn't get to pretend to hatch like a dinosaur, so I wish I'd gone here instead! !